1) AN INPUT MEASUREMENT BASIS. 2) AN INVENTORY VALUATION METHOD. 3) A COST ACCUMULATION METHOD. 4) A COST FLOW ASSUMPTION. 5) A CAPABILITY OF RECORDING INVENTORY COST FLOWS AT CERTAIN INTERVALS. THESE FIVE PARTS AND THE ALTERNATIVES UNDER EACH PART ARE SUMMARIZED IN EXHIBIT 2-1. 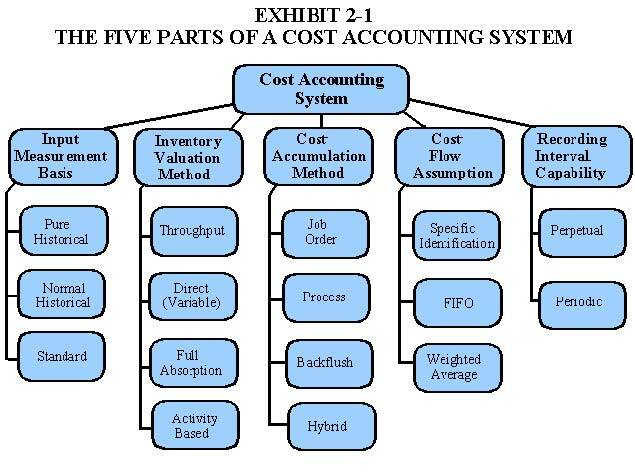 NOTE THAT MANY POSSIBLE COST ACCOUNTING SYSTEMS CAN BE DESIGNED FROM THE VARIOUS COMBINATIONS OF THE AVAILABLE ALTERNATIVES, ALTHOUGH NOT ALL OF THE ALTERNATIVES ARE COMPATIBLE. SELECTING ONE PART FROM EACH CATEGORY PROVIDES A BASIS FOR DEVELOPING AN OPERATIONAL DEFINITION OF A SPECIFIC COST ACCOUNTING SYSTEM.